This article shows how the cost of Universal Basic Income (UBI) is often misunderstood and greatly exaggerated. 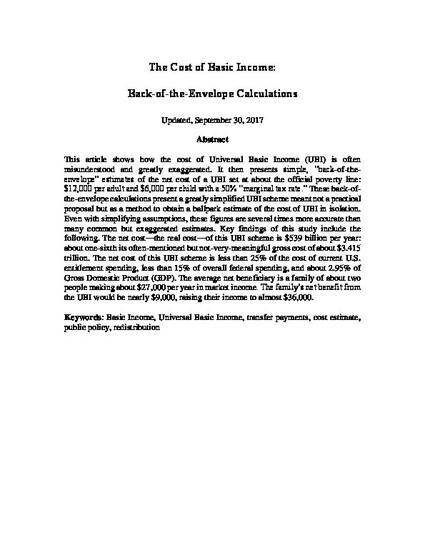 It then presents simple, “back-of-the-envelope” estimates of the net cost of a UBI set at about the official poverty line: $12,000 per adult and $6,000 per child with a 50% “marginal tax rate.” These back-of-the-envelope calculations present a greatly simplified UBI scheme meant not a practical proposal but as a method to obtain a ballpark estimate of the cost of UBI in isolation. Even with simplifying assumptions, these figures are several times more accurate than many common but exaggerated estimates. Key findings of this study include the following. The net cost—the real cost—of this UBI scheme is $539 billion per year: about one-sixth its often-mentioned but not-very-meaningful gross cost of about $3.415 trillion. The net cost of this UBI scheme is less than 25% of the cost of current U.S. entitlement spending, less than 15% of overall federal spending, and about 2.95% of Gross Domestic Product (GDP). The average net beneficiary is a family of about two people making about $27,000 per year in market income. The family’s net benefit from the UBI would be nearly $9,000, raising their income to almost $36,000.